Yesterday, we reported about a leaked press render of the Samsung Galaxy Note8. And late last afternoon, the ever reliable evleaks, uploaded a second image of the upcoming phablet, which show off the dual camera set up, and two colour variants of the device. 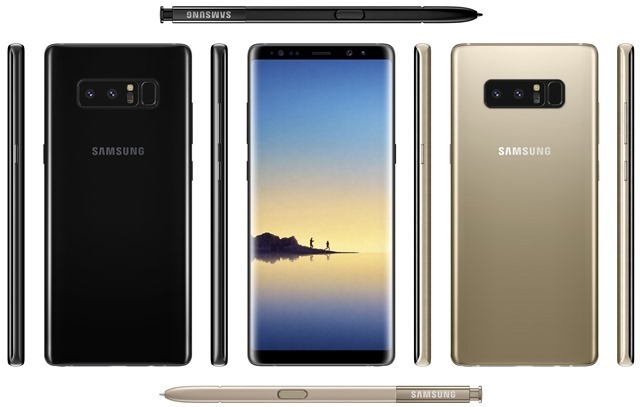 The Note 8 will apparently be available in Black and Gold variants, as seen above. And you can see the stylus pens as well. Now for the more important piece of hardware, the dual cameras. You can see the horizontally placed dual lens on the back panel, which are rumoured to be 12MP cameras with optical image stabilization. Sitting next to the cameras is what appears to be the LED flash module, and to the right of which is a fingerprint scanner. The placement of the fingerprint sensor looks a bit more awkward than the S8’s, but given that the Note8 is a large device, which is intended to be used with both hands, you are much more likely to reach for the right edge of the back panel more easily, where the fingerprint scanner is housed. That is unless you are a lefty, in which case it will annoy you for sure. The Note8 allegedly has a 6.3-inch Super AMOLED 2K display, is powered by a Qualcomm Snapdragon 835 or Samsung Exynos 8895 processor with 6GB of RAM, and a 3,300 mAh battery. We only have to wait for 21 days more, as Samsung will unveil the Galaxy Note 8 on August 23, 2017. Samsung Galaxy Note8 leaked images show off the dual cameras. Gold and Black variants.